Track down the truth during Family History Month. Discovering the past is an adventure which can take people to many places, they never dreamt of going. Hopefully their local library is not one of them! Your local Sutherland Shire Library provides access to many resources which will help you on the journey of discovery, and staff who are able to assist along the way. You can see what the library's resources, have on offer from the comfort of your home, however all (but Trove) require you to be in one of the Shire's libraries to retrieve the documents relating to any search. 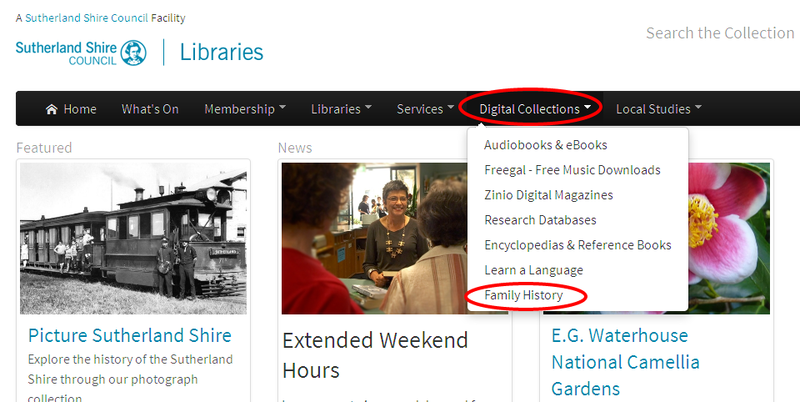 Find the Sutherland Shire Library home page, look for Digital Collections > Family History. Ancestry Library Edition, Biographical Database of Australia, British Newspaper Archive, FindMyPast, Internet History Resources, Sydney Morning Herald Archives and Trove. Most allow you to see the range of information they have and search, but restrict access to the original documents attached to any search results. Come into the library to get free access to those original records!! Ancestry has original documents which can provide clues to a persons life. Take the surname Williams. Military records, offered up this document, from the New Zealand WWI Nominal Rolls. For each man enlisted, it provides his Company, Serial No. Rank, Full name, Occupation and Name & Address of Next of Kin. Use this information to further explore military and civilian records. Or follow the fortunes of those in the care of government, like Rosa Mooney. She was just 4 3/4 years of age when she was "deserted by her father, mother dead", April 3rd 1865. (Birth date Jul 1860?) Rosa is a sister to ?? and Elizabeth ?? . On December 29th 1874, she was apprenticed to Mr J.B. Evans of Candelo, at the age of thirteen. Newspapers of the time could fill in what happened next? Trove may be worth a look. FindMyPast is another database with original documentation that can help to fill in the gaps. Visit your library during Family History Month, and talk to staff to get started.